Bahria International Hospital Lahore Punjab. • 5-year post qualification relevant experience. • Preferably in ICU, SICU, ER, Operation Theatre, General Surgery, N ICU & Liver Transplant Unit. 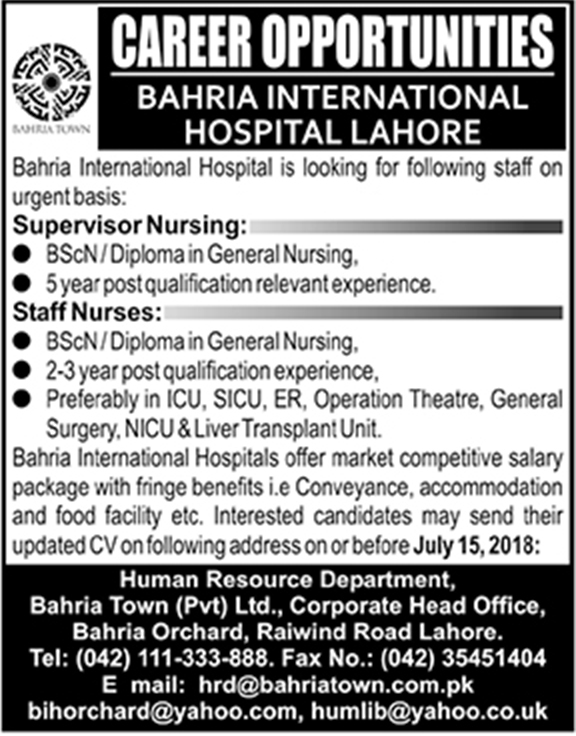 Bahria International Hospitals offer market competitive salary package with fringe benefits i.e Conveyance, accommodation and food facility etc. Interested candidates may send their updated CV on the following address on or before July 15, 2018. Bahria Orchard, Raiwind Road Lahore.